Water Lovers--here's your new best friend--Citrus County, Florida. 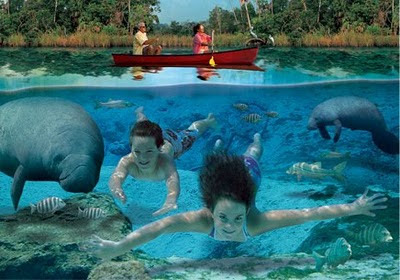 Whether you enjoy kayaking, canoeing, scuba diving, or snorkeling, go to http://www.visitcitrus.com/. This magical part of Florida offers both wildlife and landscaped parks and marine spectacles. On land there's birding, blueberries, and butterflies. For the adults, Citrus County has it all covered with golf and spas. For the complete land and water experience, discover the Homosassa Springs State Wildlife Park. Stroll along paved trails and witness the native wildlife including deer, bob cats, grey fox, and cougars at close range. The park is also a refuge for injured and rehabilitating manatee. The natural spring environment allows them an opportunity to re-acclimate themselves to a more natural environment before they are returned to the wild. Swim to a manatee-nose-to-nose! No kidding! Plan your trip now by visiting http://www.visitcitrus.com/ and for money-saving travelers, check out their "Crystal Cash" page for discounts, promos and more on hotels, boat rentals, attractions and restaurants! Write back and share your adventure right here!